This page covers a few issues surrounding the headlamp, in particular which way it dips, how to improve it and how to change the bulbs. The Aprilia parts fiche for the Futura lists three different headlights, one for the UK, one for the rest of the EU and one for the USA. This issue mainly effects the UK, where many of the Futuras on the road are EU spec, and originally had a right dipping headlight. Detailed information is available on the Parallel imports page. Each of the bulbs is an H7 single filament halogen bulb, and not an H4 as it states in the manual. 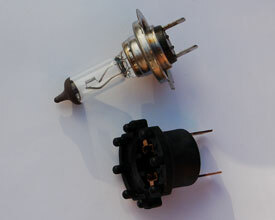 Each bulb also sits in an adapter (pictured right)which needs to be removed from the original bulb and fitted to the new one. 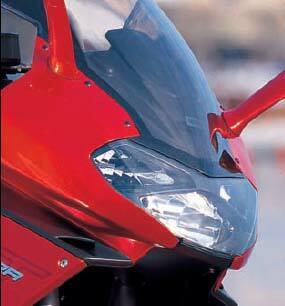 Though it looks the same from the outside, a Falco headlight will not fit a Futura. Some owners have wired the headlights so that the dip beam comes on with the main. For more information, see the light switch mod page. See also the HID upgrade page, the battery page and the electrical system page.